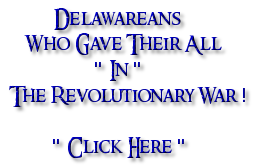 The following below list is provided in the memory of the Delawarean's that gave their all to their State and Country during the " Civil War " which occurred between " April 12, 1861 – May 9, 1865 (4 years, 3 weeks and 6 days) ". This list is " not ", as of yet, complete. Please check back as the list grows. Many of these men came from other states such as Pennslyvania, New Jersey, and Maryland and are therefore, of course, not from Delaware. 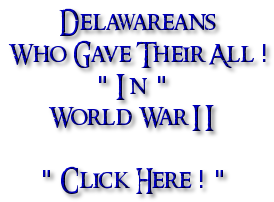 They did, however, serve in Delaware Infantry Regiments and are included on this list. The "Online Memorial" column behind each name refers to the online "Find A Grave" website that allows you to build online memorials to these soldiers. The ones with a " Yes " after their names in the Online Memorial Column show their online memorial by clicking on that notation. If you know where any of the " unknown " soldiers are interred please send me an "email" and let me know so that I can create an online memorial for them.
" Ken ~ aka Birdman "
Ken is a "Find A Grave Member" that has helped with not only the Delaware Soldiers but all the soldiers interred at the Antietam National Cemetery. 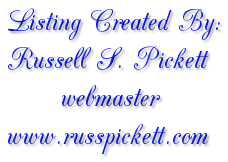 He has transfered many of the Delaware records that he created to me so that I could update their bios and he also spent a lot of time and effort taking and adding photos of their headstones. 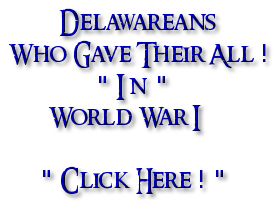 Chris is a "Find A Grave Member" that has helped to not only track down where many of the Delaware Soldiers and soldiers from other states are interred in Delaware but also has researched many of their actual dates of death.
" 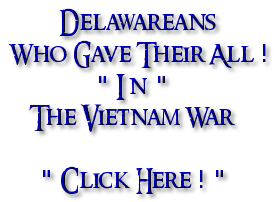 Additional Listings of Delawarean's who " Gave Their All " ! " Cenotaph = A memorial stone only ~ " OR " ~ Remains not recovered ~ " OR " ~ Interred somewhere unknown. Abel, John H. ~ Battle of Fredericksburg ~ n/a Private 1st Delaware Inf. December 13, 1862 " Unknown " " Yes "
August 30, 1862 " Unknown " " Yes "
Adams, Napoleon ~ Washington, D.C. ~ Private 1st Delaware Inf. Washington, DC " Yes "
Adkins, John ~ unknown ~ Private 1st Delaware Inf. Aikin, William ~ Andersonville Prison ~ ~ ( POW ) Private 7th Delaware Inf. Andersonville, GA " Yes "
Albertus, John ~ Battle of Antietam ~ n/a Private 2nd Delaware Inf. September 17, 1862 " Unknown " " Yes "
Alexander, Samuel L. ~ Virginia ~ Private 1st Delaware Inf. Algier, William ~ unknown ~ Private 1st Delaware Inf. Ander, William M. ~ unknown ~ Corporal 1st Delaware Inf. Anderson, James ~ unknown ~ Private 2nd Delaware Inf. Anderson, Smith ~ unknown ~ n/a Private 2nd Delaware Inf. Armon, Frederick ~ unknown ~ Private 1st Delaware Inf. Artis, Richard ~ Frederick ~ n/a Corporal 3rd Delaware Inf. December 21, 1862 " Unknown " " Yes "
Artist, Joshua C. ~ Washington, D.C. ~ n/a Private 1st Delaware Inf. July 13, 1864 " Unknown " " Yes "
Askins, Thomas ~ Battle of Antietam ~ n/a Private 1st Delaware Inf. August, Charles H. ~ Battle of Gettysburg ~ n/a Private 2nd Delaware Inf. July 3, 1863 " Unknown " " Yes "
Baily, James E. ~ Virginia ~ Major 3rd Delaware Inf. Bailey, John ~ unknown ~ Private 1st Delaware Inf. Baird, Andrew ~ Virginia ~ Corporal 4th Delaware Inf. July, 1863 " Unknown " " Yes "
Baker, Levi ~ unknown ~ n/a Private 2nd Delaware Inf. Banett, Robert ~ unknown ~ n/a Private 4th Delaware Inf. Bannard, George ~ Delaware ~ n/a Private 1st Delaware Inf. Feb 24, 1864 " Unknown " " Yes "
Banner, Charles ~ unknown ~ ~ ( POW ) Private 2nd Delaware Inf. Banwax, William ~ unknown ~ n/a Private 1st Delaware Inf. Barcus, Lewis ~ unknown ~ Private 3rd Delaware Inf. Hopewell, VA " Yes "
Barker, John H. ~ unknown ~ Private 3rd Delaware Inf. Washington, D.C. " Yes "
Barlow, Charles W. ~ North Carolina ~ n/a ~ ( POW ) Private 4th Delaware Inf. Salisbury, NC " Yes "
Barlow, George ~ Virginia ~ n/a Private 4th Delaware Inf. February 28, 1863 " Unknown " " Yes "
Barrell, George W. ~ unknown ~ unknown 4th Delaware Inf. Alexandria, VA " Yes "
Barrett, Robert ~ Siege of Petersburg ~ Private 4th Delaware Inf. Petersburg, VA " Yes "
( See the story on his record for more on him! ) Private 3rd Delaware Inf. June 19, 1864 " Unknown " " Yes "
Bateman, Perry ~ District Of Columbia ~ Private 4th Delaware Inf. Baxter, Alexander ~ unknown ~ n/a Private 1st Delaware Inf. Beggs, William Henry ~ unknown ~ n/a Private 1st Delaware Inf. Benjamin, William Y. ~ District Of Columbia ~ Private 4th Delaware Inf. Bennett, Henry M. ~ Battle of Antietam ~ n/a Corporal 2nd Delaware Inf. Benwagner, John ~ unknown ~ n/a Private 1st Delaware Inf. Berger, Gottlieb ~ unknown ~ Private 2nd Delaware Inf. Betts, Samuel M. ~ Battle of Antietam ~ n/a Corporal 3rd Delaware Inf. Biddle, Samuel H. ~ unknown ~ Corporal 2nd Delaware Inf. Biles, Samuel T. ~ Battle of Cold Harbor ~ n/a Private 3rd Delaware Inf. June 3,1864 " Unknown " " Yes "
Bills, Samuel F. ~ unknown ~ n/a Private 3rd Delaware Inf. Black, John S. ~ Battle of Gettysburg ~ Private 1st Delaware Inf. Gettysburg, PA " Yes "
Black, William ~ Delaware ~ n/a Private 4th Delaware Inf. February 24, 1864 " Unknown " " Yes "
Blades, Major G. ~ unknown ~ Private 1st Delaware Inf. Sharpsburg, MD " Yes "
Blizzard, Thomas ~ Siege of Petersburg ~ n/a Private 4th Delaware Inf. June 18, 1864 " Unknown " " Yes "
Boice, Joseph P. ~ Andersonville Prison ~ ~ ( POW ) Private 4th Delaware Inf. Bonner, William ~ unknown ~ n/a Private 2nd Delaware Inf. Booth, John P. ~ unknown ~ n/a Corporal 3rd Delaware Inf. Bornett, Peter ~ unknown ~ n/a Private 3rd Delaware Inf. Borrell, George W. ~ Virginia ~ n/a Private 4th Delaware Inf. July 7, 1864 " Unknown " " Yes "
Bostic, William ~ Gettysburg ~ n/a Private 3rd Delaware Inf. Bostler, Peter ~ Gettysburg ~ Private 2nd Delaware Inf. Bowers, Jacob ~ unknown ~ n/a Private 2nd Delaware Inf. Bowers, Samuel ~ unknown ~ n/a Private 2nd Delaware Inf. Boyd, Jacob ~ Gettysburg ~ Sergeant 2nd Delaware Inf. Boyer, James F. ~ Virginia ~ Private 1st Delaware Inf. Fredericksburg, VA " Yes "
( Father of Pvt. Manus Boyles, Jr. ) Private 1st Delaware Inf. ( Son of Pvt. Manus Boyles, Sr. ) Private 1st Delaware Inf. Bracey, Samuel C. ~ Maryland ~ n/a Private 2nd Delaware Inf. November 19, 1861 " Unknown " " Yes "
Bradford, Richard ~ unknown ~ Private 1st Delaware Inf. Newark, DE " Yes "
Bradford, Robert H. ~ unknown ~ n/a Private 1st Delaware Inf. Brierly, John ~ Battle of Antietam ~ n/a Corporal 1st Delaware Inf. ( aka. Peter G. Briely ) Sergeant 4th Delaware Inf. Brinkman, Adolph ~ Battle of Antietam ~ Private 2nd Delaware Inf. Broadway, Samuel ~ unknown ~ n/a Private 4th Delaware Inf. Brown, Caleb S. ~ unknown ~ Corporal 4th Delaware Inf. Brown, John H. ~ Andersonville Prison ~ ~ ( POW ) Private 2nd Delaware Inf. Brown, Lyman M. ~ Battle of Cold Harbor ~ Private 4th Delaware Inf. Mechanicsville, VA " Yes "
Brown, Samuel ~ unknown ~ unknown 7th Delaware Inf. Dover, DE " Yes "
Brunner, Jacob ~ unknown ~ n/a Private 2nd Delaware Inf. Bryan, Joseph W. ~ Virginia ~ n/a Private 4th Delaware Inf. Bryan, Jeremiah ~ Battle of Cold Harbor ~ n/a Corporal 4th Delaware Inf. June 3, 1864 " Unknown " " Yes "
Buckson, Stephen T. ~ Siege of Petersburg ~ n/a Sergeant 4th Delaware Inf. 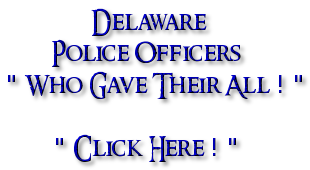 Pennsville, NJ " Yes "
Burke, William Edward ~ Suffolk, VA ~ Corporal 1st Delaware Inf. Frederica, DE " Yes "
Burnes, Thomas ~ Frederick, MD ~ n/a Private 1st Delaware Inf. Burrows, Robert F. ~ unknown ~ n/a Corporal 1st Delaware Inf. Burton, Richard ~ Delaware ~ n/a Private 3rd Delaware Inf. November 2, 1864 " Unknown " " Yes "
Cain, Joseph ~ unknown ~ n/a Private 4th Delaware Inf. July 5, 1863 " Unknown " " Yes "
Calahan, Thomas ~ unknown ~ n/a Private 2nd Delaware Inf. Caldwell, William ~ Andersonville Prison ~ ~ ( POW ) Private 2nd Delaware Inf. Calhoun, Jasper ~ Battle of Cold Harbor ~ Private 1st Delaware Inf. Callahan, Cornelius ~ unknown ~ Private 2nd Delaware Inf. Callahan, John ~ Andersonville Prison ~ ~ ( POW ) Private 1st Delaware Inf. Callen, William ~ unknown ~ n/a Private 2nd Delaware Inf. Campbell, Eli ~ unknown ~ Private 1st Delaware Inf. Campbell, John ~ Virginia ~ Private 4th Delaware Inf. Canning, Henry ~ Andersonville Prison ~ ~ ( POW ) Drummer 2nd Delaware Inf. Cannon, William Laws ~ Bel Air, MD ~ Captain 1st Delaware Cav. Bridgeville, DE " Yes "
Cant, Thomas ~ VA ~ n/a Private 3rd Delaware Inf. 1862 " Unknown " " Yes "
Brother of ~ Pvt. Thomas P. Carey Sergeant 1st Delaware Inf. Carey, Stephen ~ Battle of Gettysburg ~ Private 2nd Delaware Inf. Carey, Thomas ~ Delaware ~ n/a Private 3rd Delaware Inf. April 16, 1862 " Unknown " " Yes "
Brother of ~ Pvt. John C. Carey Private 1st Delaware Inf. Carlan, Charles ~ unknown ~ n/a Private 1st Delaware Inf. January 13, 1864 " Unknown " " Yes "
Carlan, John ~ unknown ~ n/a Private 1st Delaware Inf. Carr, Charles ~ Battle of Cold Harbor ~ Private 4th Delaware Inf. Carr, Hudson ~ Battle of Cold Harbor ~ n/a Private 1st Delaware Inf. 1864 " Unknown " " Yes "
Carr, John ~ unknown ~ n/a Private 2nd Delaware Inf. Carter, John ~ Siege of Petersburg ~ Private 4th Delaware Inf. Cash, William ~ Delaware ~ n/a Private 4th Delaware Inf. September 22, 1862 " Unknown " " Yes "
Cassidy, William ~ unknown ~ n/a Private 2nd Delaware Inf. Cavanaugh, Michael ~ Battle of Gettysburg ~ Sergeant 2nd Delaware Inf. Cavender, James G. ~ VA ~ n/a Private 4th Delaware Inf. May 27, 1863 " Unknown " " Yes "
Cegrist, Jacob ~ VA ~ n/a Private 4th Delaware Inf. April 12, 1865 " Unknown " " Yes "
Chaffin, Enoch ~ unknown ~ n/a Private 1st Delaware Inf. Cherer, Anthony ~ unknown ~ n/a Private 1st Delaware Inf. July 28, 1864 " Unknown " " Yes "
Chrisfield, John G. ~ unknown ~ n/a Private 5th Delaware Inf. Clark, George ~ VA ~ n/a Private 4th Delaware Inf. Clark, Thomas ~ unknown ~ n/a Private 2nd Delaware Inf. Clifton, David ~ Pennsylvania ~ n/a Private 3rd Delaware Inf. January 27, 1863 " Unknown " " Yes "
Cline, John ~ unknown ~ n/a Private 1st Delaware Inf. Cloud, Joseph J. ~ Washington, D.C. ~ Private 4th Delaware Inf. Cochrane, Samuel ~ unknown ~ n/a Private 1st Delaware Inf. Cochrum, James H. ~ unknown ~ n/a Private 4th Delaware Inf. Colburn, Joseph M. ~ Maryland ~ n/a Private 3rd Delaware Inf. December 12, 1863 " Unknown " " Yes "
Coleman, George P. ~ unknown ~ n/a Corporal 2nd Delaware Inf. Coleman, Henry D. ~ unknown ~ Private 2nd Delaware Inf. Collins, John ~ VA ~ n/a Private 4th Delaware Inf. February 1, 1864 " Unknown " " Yes "
Conaway, Fergus ~ Andersonville Prison ~ ~ ( POW ) Private 1st Delaware Inf. Connelly, Stephen ~ Battle of Antietam ~ Private 2nd Delaware Inf. Conner, Hugh ~ unknown ~ n/a Private 1st Delaware Inf. Cooper, Josiah G. ~ unknown ~ Private 4th Delaware Inf. Cornor, Cornelius ~ Andersonville Prison ~ ~ ( POW ) Private 2nd Delaware Inf. Cordrey, George E. ~ Battle of Antietam ~ n/a Corporal 3rd Delaware Inf. Correll, Lewis ~ unknown ~ Sergeant 1st Delaware Inf. Corson, Abijah ~ Petersburg ~ n/a Sergeant 3rd Delaware Inf. June 2, 1864 " Unknown " " Yes "
Cortwell, Amos ~ unknown ~ n/a Private 1st Delaware Inf. Coulter, Henry ~ North Carolina ~ n/a ~ ( POW ) Sergeant 4th Delaware Inf. Cowan, John ~ unknown ~ n/a Private 2nd Delaware Inf. Cox, Benjamin ~ unknown ~ n/a Private 1st Delaware Inf. Cox, Garrett V. ~ unknown ~ Private 1st Delaware Inf. Middletown, DE " Yes "
Cox, John S. ~ unknown ~ n/a Private 1st Delaware Cav. February 11, 1864 " Unknown " " Yes "
Cox, Joshua ~ Delaware ~ n/a Private 3rd Delaware Inf. May 2, 1862 " Unknown " " Yes "
Crawford, John ~ Five Forks ~ n/a Private 4th Delaware Inf. April 1, 1865 " Unknown " " Yes "
Creller, Samuel ~ unknown ~ n/a Private 1st Delaware Inf. Crookshanks, William ~ unknown ~ n/a Private 2nd Delaware Inf. May 12, 1864 " Unknown " " Yes "
Crow, John H. ~ unknown ~ n/a Private 1st Delaware Inf. Crumlish, Patrick ~ unknown ~ n/a Private 2nd Delaware Inf. Cullen, Burton ~ VA ~ n/a Private 3rd Delaware Inf. June, 1862 " Unknown " " Yes "
Cummings, Benjamin ~ VA ~ n/a Private 4th Delaware Inf. Cummings, William S. ~ VA ~ n/a Private 4th Delaware Inf. Cummins, William ~ Battle of Antietam ~ Private 2nd Delaware Inf. Cunningham, Robert ~ Andersonville Prison ~ ~ ( POW ) Private 1st Delaware Inf. Curry, James ~ unknown ~ n/a Private 3rd Delaware Inf. Cush, Barney ~ Five Forks ~ n/a Private 4th Delaware Inf. Daily, Martin ~ unknown ~ n/a Private 1st Delaware Inf. Daniells, John ~ Maryland ~ n/a Private 3rd Delaware Inf. March 2, 1864 " Unknown " " Yes "
Daniels, William F. ~ Battle of Cold Harbor ~ Corporal 4th Delaware Inf. Daniels, William R. ~ Battle of Cold Harbor ~ n/a Private 3rd Delaware Inf. Darlington, William ~ unknown ~ n/a Corporal 1st Delaware Inf. Davidson, William G. ~ unknown ~ n/a Sergeant 2nd Delaware Inf. Davis, John A. ~ Battle of Cold Harbor ~ Private 4th Delaware Inf. Davis, Thomas ~ unknown ~ Private 3rd Delaware Inf. Dean, William ~ VA ~ n/a unknown 1st U.S.
January 27, 1865 " Unknown " " Yes "
Dehan, John P. ~ unknown ~ n/a Private 5th Delaware Inf. Delarne, Antoine ~ unknown ~ n/a Private 2nd Delaware Inf. Dennis, John ~ unknown ~ n/a Private 1st Delaware Inf. Denson, Benjamin P. ~ VA ~ Corporal 1st Delaware Inf. Dextor, Norman D. ~ unknown ~ Corporal 4th Delaware Inf. Dickenson, Solomon ~ Battle of Antietam ~ n/a Private 2nd Delaware Inf. Dickerson, Charles ~ unknown ~ Private 2nd Delaware Inf. Dickerson, David ~ unknown ~ n/a Private 2nd Delaware Inf. Dickson, James P. ~ unknown ~ n/a Private 1st Delaware Inf. Dodd, James S. ~ unknown ~ n/a Private 3rd Delaware Inf. Dolan, Thomas ~ unknown ~ n/a Private 1st Delaware Inf. Donnelly, Luke ~ unknown ~ n/a Private 1st Delaware Inf. Donohue, Hugh ~ Andersonville Prison ~ ~ ( POW ) Private 2nd Delaware Inf. Dooling, Daniel ~ unknown ~ n/a Private 3rd Delaware Inf. ( Related to William below ? ) Private 3rd Delaware Inf. New Bloomfield, PA " Yes "
Dorsey, William G. ~ Battle of Gettysburg ~ n/a Private 1st Delaware Inf. Dotten, Elisha ~ unknown ~ n/a Private 2nd Delaware Inf. Dougherty, Hugh ~ unknown ~ n/a Private 1st Delaware Inf. Dougherty, James ~ unknown ~ Private 4th Delaware Inf. Dougherty, James ~ Battle of Gettysburg ~ Private 1st Delaware Inf. Dougherty, John ~ Washington, D.C. ~ n/a Private 1st Delaware Inf. June 22, 1863 " Unknown " " Yes "
Dougherty, Thomas ~ Antietam ~ n/a Private 5th Delaware Inf. Dougherty, William ~ unknown ~ n/a Corporal 2nd Delaware Inf. Doyle, James ~ unknown ~ n/a Private 1st Delaware Inf. Doyle, John ~ unknown ~ Private 4th Delaware Inf. Draper, Abram H. ~ unknown ~ n/a Sergeant 4th Delaware Inf. January 22, 1863 " Unknown " " Yes "
Draper, Benjamin ~ Battle of Weldon Railroad ~ n/a Private 4th Delaware Inf. August 21, 1864 " Unknown " " Yes "
Draper, Ephraim ~ VA ~ Corporal 3rd Delaware Inf. Draper, Isaac T. ~ Rhode Island ~ Private 3rd Delaware Inf. Drummond, William T. ~ Harpers Ferry, VA ~ n/a Private 1st Delaware Inf. October 23, 1862 " Unknown " " Yes "
Duffey, Daniel ~ Frederick, MD ~ n/a Private 1st Delaware Inf. Dull, Patrick ~ unknown ~ n/a Private 2nd Delaware Inf. Dunham, Mathew ~ unknown ~ n/a Private 3rd Delaware Inf. June 1, 1864 " Unknown " " Yes "
Winchester, VA " Yes "
Dunsmore, William ~ unknown ~ n/a Private 4th Delaware Inf. Ellegood, Martin W. B. ~ Battle of Gettysburg ~ Captain 1st Delaware Inf. Ellsworth, Joshua ~ unknown ~ n/a Private 3rd Delaware Inf. Emmitt, William ~ Andersonville Prison ~ ~ ( POW ) Private 1st Delaware Inf. Ennis, Frederick B. ~ Maryes Heights, VA ~ n/a Private 1st Delaware Inf. Evans, Jacob A. ~ unknown ~ n/a Private 1st Delaware Inf. Evans, John ~ Battle of Spotsylvania ~ Captain 2nd Delaware Inf. New Castle, DE " Yes "
Feiher, Samuel, Jr. ~ unknown ~ n/a Private 5th Delaware Inf. Ferguson, Franklin ~ unknown ~ n/a Private 2nd Delaware Inf. May 20, 1864 " Unknown " " Yes "
Ferrell, William H. ~ unknown ~ n/a Private 2nd Delaware Inf. Field, Samuel ~ Andersonville Prison ~ ~ ( POW ) Private 2nd Delaware Inf. File, John E. ~ unknown ~ n/a Private 4th Delaware Inf. August 3, 1864 " Unknown " " Yes "
Filler, John ~ unknown ~ n/a Private 2nd Delaware Inf. Milton, DE " Yes "
Website: "Click Here"! Lieutenant 10th U.S. Inf. Fisher, Richard W. ~ Battle of Chancellorsville ~ n/a Private 1st Delaware Inf. May 3, 1863 " Unknown " " Yes "
Fleming, Henry ~ Washington, D.C. ~ n/a Private 3rd Delaware Inf. October 10, 1864 " Unknown " " Yes "
Flood, Thomas ~ unknown ~ n/a Private 2nd Delaware Inf. Ford, Edward ~ unknown ~ Private 4th Delaware Inf. Ford, Joshua ~ Washington ~ Private 1st Delaware Inf.
" DIED BY MISTAKE "
Ford, Slayter ~ Wilmington, De ~ n/a Private 3rd Delaware Inf. Foreacre, Isaac ~ Battle of Antietam ~ n/a Private 2nd Delaware Inf. Foreacres, William H. ~ Battle of the Wilderness ~ n/a Private 1st Delaware Inf. May 6, 1864 " Unknown " " Yes "
Foster, Robert H. ~ unknown ~ n/a Private 3rd Delaware Inf. Fowler, John ~ unknown ~ n/a Private 4th Delaware Inf. Fox, Richard K. ~ Battle of Antietam ~ unknown 2nd Delaware Inf. Fox, Robert M. ~ unknown ~ n/a Private 4th Delaware Inf. Francis, Charles ~ unknown ~ n/a Private 2nd Delaware Inf. Gallagher, Thomas ~ Virginia ~ n/a Private 4th Delaware Inf. June 12, 1864 " Unknown " " Yes "
Gallagher, William I. ~ unknown ~ n/a Lieutenant 7th Delaware Inf. Aug 11, 1864 " Unknown " "Yes"
Gamble, James ~ District of Columbia ~ n/a Private 1st Delaware Inf. May 11, 1863 " Unknown " " Yes "
( aka. Gentholz, Gottle B. ) Private 2nd Delaware Inf. Garrison, Benjamin F. ~ Fort Monroe, VA ~ n/a Private 1st Delaware Inf. January 29, 1862 " Unknown " " Yes "
Gastie, George H. ~ unknown ~ n/a Private 3rd Delaware Inf. November 13, 1862 " Unknown " " Yes "
Odessa, Delaware " Yes "
Gear, Charles M. ~ unknown ~ n/a Private 5th Delaware Inf. Wilmington, Delaware " Yes "
Frederica, Delaware " Yes "
September 17, 1864 " Unknown " " Yes "
Williamsville, DE " Yes "
June 20, 1864 " Unknown " " Yes "
Mechanicsburg, VA " Yes "
January 10, 1864 " Unknown " " Yes "
June 29, 1862 " Unknown " " Yes "
November 27, 1861 " Unknown " " Yes "
Canton, NJ " Yes "
Brooklyn, NY " Yes "
June 26, 1862 " Unknown " " Yes "
November 26, 1862 " Unknown " " Yes "
September 27, 1863 " Unknown " " Yes "
Trumansburg, NY " Yes "
August 18, 1862 " Unknown " " Yes "
May 5, 1864 " Unknown " " Yes "
October 14, 1862 " Unknown " " Yes "
August 12, 1864 " Unknown " " Yes "
October 15, 1863 " Unknown " " Yes "
April 16, 1865 " Unknown " " Yes "
May 20, 1862 " Unknown " " Yes "
May 2, 1863 " Unknown " " Yes "
December 4, 1863 " Unknown " " Yes "
November 19, 1862 " Unknown " " Yes "
Hampton, VA " Yes "
October 23, 1863 " Unknown " " Yes "
May 15, 1864 " Unknown " " Yes "
Prospect Park, PA " Yes "
April 5, 1865 " Unknown " " Yes "
Bellefonte, DE " Yes "
October 16, 1862 " Unknown " " Yes "
September 17, 1862 " Unknown "
Leipsic, DE " Yes "
July 9, 1864 " Unknown " " Yes "
October 1, 1864 " Unknown " " Yes "
" Died By Accident "
August, 1863 " Unknown "
( Near St. Johnstown, DE ) " Yes "
June 11, 1864 " Unknown " " Yes "
October 4, 1864 " Unknown " " Yes "
Little Rock, AR " Yes "
June, 1864 " Unknown " " Yes "
August 26, 1863 " Unknown " " Yes "
December 25, 1862 " Unknown " " Yes "
October 1, 1862 " Unknown " " Yes "
June 1, 1862 " Unknown " " Yes "
August 25, 1864 " Unknown " " Yes "
February 18, 1864 " Unknown " " Yes "
June 29, 1864 " Unknown " " Yes "
December 16, 1862 " Unknown " " Yes "
New Garden, PA " Yes "
Beverly, NJ " Yes "
February 25, 1862 " Unknown " " Yes "
November 3, 1863 " Unknown " " Yes "
November 25, 1862 " Unknown " " Yes "
December 30, 1864 " Unknown " " Yes "
October 9, 1862 " Unknown " "Yes"
July 2, 1863 " Unknown " " Yes "
Smyrna, Delaware " Yes "
January, 1865 " Unknown " " Yes "
May 3, 1862 " Unknown " " Yes "
May 10, 1864 " Unknown " " Yes "
February 15, 1863 " Unknown " " Yes "
February 14, 1864 " Unknown " " Yes "
April 15, 1863 " Unknown " " Yes "
October 25, 1862 " Unknown " " Yes "
Cheswold, DE " Yes "
November 14, 1864 " Unknown " " Yes "
December 20, 1862 " Unknown " " Yes "
July 26, 1864 " Unknown " " Yes "
December 31, 1862 " Unknown " " Yes "
September 24, 1862 " Unknown " " Yes "
April 1, 1862 " Unknown " " Yes "
February 6, 1865 " Unknown " " Yes "
January 30, 1862 " Unknown " " Yes "
October 31, 1862 " Unknown " " Yes "
Nashville, TN " Yes "
December 18, 1862 " Unknown " " Yes "
Richmond, VA " Yes "
March 11, 1864 " Unknown " " Yes "
August 2, 1863 " Unknown " " Yes "
unknown " Unknown " "Yes"
November 16, 1862 " Unknown " " Yes "
October 30, 1862 " Unknown " " Yes "
Christiana, DE " Yes "
Wilminngton, DE " Yes "
Bala Cynwyd, PA " Yes "
November 8, 1862 " Unknown " " Yes "
April, 1863 " Unknown " " Yes "
July 1, 1862 " Unknown " " Yes "
September 14, 1862 " Unknown " " Yes "
June 16, 1862 " Unknown " " Yes "
June 16, 1864 " Unknown " " Yes "
May 11, 1864 " Unknown " " Yes "
June 23, 1864 " Unknown " " Yes "
November 7, 1864 " Unknown " "Yes"
November 1, 1864 " Unknown " " Yes "
January 30, 1863 " Unknown " " Yes "
November 28, 1962 " Unknown " " Yes "
January 29, 1863 " Unknown " " Yes "
November 3, 1862 " Unknown " " Yes "
1865 " Unknown " " Yes "
February 26, 1864 " Unknown " " Yes "
September 21, 1864 " Unknown " " Yes "
Culpeper, VA " Yes "
April 27, 1862 " Unknown " " Yes "
July 26, 1862 " Unknown " " Yes "
December 6, 1864 " Unknown " " Yes "
Andersonville, Georgia " Yes "
October 3, 1862 " Unknown " " Yes "
May 13, 1863 " Unknown " " Yes "
December 26, 1863 " Unknown " " Yes "
Newark, NJ " Yes "
October 8, 1864 " Unknown " " Yes "
December 17, 1862 " Unknown " " Yes "
December 30, 1862 " Unknown " " Yes "
October 28, 1862 " Unknown " " Yes "